Best Condenser Mics: Whether its home recording or recording for a professional studio, many would agree that the condenser mics are the mics to go for! Besides recording, condenser microphones are incredibly important when it comes to building a studio as they are just about the centerpiece of all your gear setups. To create good sound quality and record vocals in a recording studio environment, you would ideally need a large diaphragm condenser mic. This is due to the fact that the mic tends to have a wider frequency response and is usually high on the sensitivity that allows you the privilege of recording vocals from a reasonable distance and, more importantly at a comfortable level. There are, of course, tons of best condenser mics to choose from when but there are several things that needs consideration. Before we count down 10 of thebest condensed mic here’s a handy guide on how we choose it and how you can too. How To Take Care of Condenser Mics? When it comes to selecting the perfect microphone, you should know that there are two kinds of microphones: Condenser and Dynamic. Of the two, the best condenser mics are more common and more popular that’s because of they come with a wider frequency response along with their greater accuracy in vocal reproduction. Condenser mics offer two types of microphones: small and large diaphragm. While small diaphragm is perfect for recording high frequency sounds like violins, and the large ones are ideal for deep sound for acoustic bass. As for the Dynamic microphone, these are ideal for live concerts and the events of the sort. These mics are usually much more rugged than the condenser microphones, but they work pretty well and are known to provide accurate recording vocals and are of course, perfect for an open environment, like a pub, etc. Before we begin with top condenser mics, there are handful things that went into considerations while choosing the products. We recommend you keep this in mind while you choose a condenser mic for yourself. The factors that we are listing below just about cover the most significant things that need to be weighed and judged based on what sort of product you are looking for. Intended Application: What you want a condenser mic for? Is it for recording vocals strictly, or strings or Acoustics? 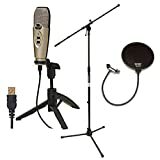 Although a condenser mic allows you to record all that you want to transfer to your computer or mixer, there is the question of the Sound Pressure Level (SPL) which we’ll discuss of elaborately. So if you plan on recording higher sound waves, condenser mics with higher SPL should be ideal. Diaphragm Size: We have talked about diaphragm size earlier and said that condenser mics with large with diaphragm tend to work better with different instruments. Sizes of the diaphragm are also related to Sound Pressure Handling. The small diaphragm mics offer high SPL applications because of the fact that they seem to withstand loud volumes. The disadvantages of using a large diaphragm are that they may end up sounding damaged when used on loud sources, on the other hand in a small diaphragm some details are lost. Polar Pattern: For vocal recording and single instrument recording, noise reduction capabilities are important. The Cardioid pattern of a condenser mic tends to capture everything in the front of the capsule and reject all background noise from the side and the back. Other patterns include Omnidirectional and Figure-8 patterns that are useful for capturing sound sources and multiple instruments. While testing for the best condenser mics, we were glad to find out that there are several budget microphones that come with the polar pattern but allow switching between Cardioid, OmniDirectional, Figure-8 along with other variants of these patterns. You can go for these, but you should know that they might not be as reliable as the specialized condensed microphones. Connectivity Option (USB or Non-USB): USB mics commonly draw power from sources like a computer, and when these sources aren’t able to provide that, then the mics battery drains out. As for non-USB condenser mics, they tend to draw electricity from the phantom power that usually comes from an audio interface or mixing desk. So going back to USB condenser mics, when the source stops working, you’ll need an additional powered USB hub. So while choosing a condenser mic, go ahead for the one with USB. 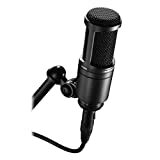 Price Range: It is significant to plan out how much you can shell out and while you consider the factors that we mentioned above, the overall budget will play a big role in deciding if you want a certain condenser mic. It’s no rocket science to know that the higher your price limit, the better the quality and larger the capability of the condenser mic. But of course, if you don’t have the money you’ll have to get one that gives you more value for your money. Frequency Response and Sensitivity: Different microphone responds to different frequencies and while high-frequency response results in larger and more enhanced treble, low-frequency response results in, more often than not, in the enhanced bass. And when it comes to the ration of input noise to an output value in a condenser mic, the higher the sensitivity, the lesser the input noise you’ll end up producing and that is something that you’ll have to consider before getting your hands on one. Added Accessories: Like we said earlier, you need to be clear about what you want to do with the condenser mic. So if you require additional accessories, you’d need to choose a condenser mic that’ll allow space for those accessories. Alternatively, you can go for combo pack offers as they are likely to be budget-friendly and less time to consume from a buyers perspective. Now that you are done with these, you can take a look at the list of best condenser mics and can get your hands on it whenever you want because we did make sure that the products are readily available. Founded in 1980, the MXL Microphones are the Professional Audio Division of Marshall Electronics and they have been specializing in industrial and consumer electronics for decades. The company makes some of the best sound equipment we have ever had the chance of testing which is largely owing to the fact the makers are keenly interested developing the best of microphones. The first MXL branded microphone was launched back in 1998, and since MXL has only worked on improving their equipment by employing innovative technology and design to manufacture microphones that are both affordable and made of high-quality material. The MXL 770 condenser microphone ranks in the top in our list of best condenser mics. The microphone has been around for quite sometimes, and till this day the piece of equipment continues to amaze recording artists across the globe largely thanks to its fantastic price/performance ratio. Cardioid Condenser Mic is a multipurpose small-diaphragm microphone that offers warm sound with extra clarity at the top which is fantastic, to say the least. It sports FET preamp with balanced, transformerless output and our testers found out that it’s excellent for vocals, pianos, acoustic guitars, strings and voice-work. The MXL 770 even uses a high-quality FET preamp with balanced output for a wide dynamic range. We really loved the 770 for its solid bass and not to mention its upfront high-end which smoothly helps balance the output of the device for a wide dynamic range. We did come across a reverb issue that was caused by the hollow casing used on the mic, but it’s nothing that can’t be taken care of. Verdict: This is a great mic for the price, and of the many things that we liked about the mic, the build was pretty impressive. The piece of equipment itself looks and feels great, and it’s easily one of the most impressive condenser microphones that we have had the privilege of testing for making the post. Established in 1962, Audio-Technica today is a group of companies devoted to designing, manufacturing, marketing, as well as the distribution of audio equipment. In its early days the company was known for making state-of-the-art phonograph cartridges, and now they are largely famous for their much popular and highly regarded wireless systems, microphones, headphones, mixers and all sorts of audio electronic devices. Over the years of establishing itself, Audio-Technica has been recipient of numerous industry awards, but that hasn’t stopped them to constantly work on making better equipment and employing innovative technologies. The Audio-Technica AT2020 is the most popular condenser mike in the market, and it’s easy to see why. The device is made by side-address studio condenser microphone technology and is basically ideal for project or home-studio applications. One of the several things that we like about this particular piece of device is that the microphone sports a high SPL handling and wide dynamic range that more or less provide unmatched versatility when you compare the mic with several other microphones available in the market right now. The device comes with a Custom-engineered low-mass diaphragm that manages to provide extended frequency response along with the superior transient response. And let’s not forget the cardioid polar pattern that the Audio-Technica AT2020 Cardioid Condenser Studio Microphone sport. It reduces pickup of sounds from the sides and rear, improving isolation of sound source, which is fantastic. Our testers spent a couple of day with the mic and found out that the mic is particularly excellent for acoustics, overhead, amps or brass and of course, the vocals. It doesn’t come with a shock mount but is more expensive than most of the mics on the list. You’ll have to buy it separately. Verdict: The Audio-Technica AT2020 is an excellent purchase and is basically and all-around, working class grunt mic. These best condenser mics are not meant to be used during live performances, so that’s that. Behringer is part of the Music Group, and they claim themselves as a different company and are pretty proud to be so. The company comes with a revolutionary vision and makes products with incredible passion with an amazing team of specialists behind their development. Intended for building the Next Big Thing, the multinational company has managed to make a mark in the industry. Spread over 16 locations with over 4,000 people working for the Music group, bound together with a limitless passion for music – the universal and most beautiful language. As per Behringer, they are driven by a single purpose to “Enable Life Changing Experiences” for all their customers. Conceived and designed by BEHRINGER Germany, Behringer B-1 is incredibly professional 1” gold-sputtered large-diaphragm device that has great audio quality. Our testers found out that the microphone is ideal for main and support microphone for the studio as well as live applications. We found it absolutely perfect for overhead and acoustic instruments. It’s probably worth mentioning here that the piece of equipment sports a cardioid pickup pattern that ends up providing outstanding sound source separation and feedback rejection. The B-1 Behringer offers switchable low-frequency roll-off and -10 dB input attenuation along with pressure-gradient transducer with the shock-mounted gold-sputtered large-diaphragm capsule. For the price the condenser mic comes at, the package also offers Heavy-duty suspension mount, windscreen, and aluminum transport case. We used if for recording mainly acoustic guitar and vocals and the result was fantastic. But of the thing that we didn’t expect and really liked that they included it was the shock mount and aluminum case. One of the catches of using this condenser mic is that we had to turn the AER compact 60 amp way down to prevent feedback. Verdict: The B-1 is an affordable, high-quality and boasts a wide frequency response from 20 Hz to 20 kHz. For the price it comes at, the Behringer B-1 is a good deal. The con that we mentioned above is going to be inconvenient to some and to those we suggest that you try out some of the condenser mics in our list of top condenser mics. Founded in 1980, Samson Technologies offer some of the best wireless microphone systems and thanks to their decades of relentless pursuit of the best, today they have managed to reign as an industry leader. They were the ones first wireless microphone system and ended up becoming a leader in the wireless field. Samson rules both consumer and professional audio industries with three of their world-famous brands, those are – Samson Audio, Samson Wireless, and Hartke. They have over 250 products that are distributed in over 140 countries across the world. Back in 2005, Samson also introduced first professional USB microphones that how now become the industry standard. That’s why its product is deserved to be added in this list of best condenser mics 2019. The condenser microphone is both versatile and affordable. This particular piece of device is a large-diaphragm studio condenser mic and features a large, dual-layer 19 mm diaphragms with a cardioid pickup pattern, using which they end up producing smooth flat frequency response. The device offers Hyper-Cardioid pickup pattern which is great because a majority of recording and live sound requires unidirectional or cardioid microphones. We really like the solid construction and stability of the Samson C01 as it offers Heavy Gauge Mesh Grill, along with gold plated XLR connector and LED Indicates 48V Phantom Power. While testing this particular condenser mic, our tester found that they could hear the strings and wood of, the brassy shimmer of a ride cymbal with crystal clarity along with the breath and resonance of a singer. For the price, we don’t think there is a better mic available. The sound quality is great. It excels in the low end, mids, as well as the highs. Cons: We found user manual needs updating. Some of the instructions were hard to follow, so the text needs more fluidity. Verdict: The Samson C01 Condenser Microphone is one of the cheapest condenser mics in our list, and we were genuinely surprised at the quality that the mic seems to offer. IF you are a budget buyer, then you should definitely get your hands on this one. CAD Audio has its origin in 1931 in a company named Astatic Corporation founded by radio operators – C.M. Chorpening and F.H. Woodworth. Together with the local engineers, the company came up with their first crystal radio microphone under the model D-104. Over the years the company has managed to build some of the best commercial microphones for a wide variety of industrial applications. Having spent over 85 years of innovation and success in the audio industry, it’s not surprising that one its products have managed to land a place on our list of top condenser mics. One of the most affordable of the lot in our list of the best condenser mic, the CAD Audio U37 USB Condenser Microphone offers some of the basic functionality of a direct audio recording via USB cable. This particular condenser mic is ideal for warm, rich recordings. It sports Cardioid pickup pattern that minimizes background noise and isolates the main sound source, which is an excellent feature. The mic comes in eight color options to choose from, and those are – black, gray, orange, white, cammo, candy apple, champagne and a combination of red and white which is our favorite. One of the highlights of the mic is the smooth, extended frequency response is excellent for singing, speech, and instruments. There is also a -10dB overload-protection switch that helps minimize distortion from loud sound sources and let’s not forget about the Bass-reduction switch that helps reduce room noise and comes along with a side-address design that is very much popular with broadcast, TV and recording studios. We liked the smooth and extended frequency response that worked really well miking acoustic instruments. The plastic exterior is less sturdy than say the more expensive counterparts in this list. There is a latency issue with this microphone, so you need to consider that before choosing to buy this. Verdict: Despite being a cheap mic, the CAD Audio U37 tends to score more that most of the expensive mics on our list. Especially considering the price, the mic has exceeded our expectation, and like the Samson C01 Condenser Mic, we’d recommend you to get your hands on this one if you want to go for the best condenser mics 2019. Blue Mic is known for designing and making microphones, headphones, signal processors, recording tools, and music accessories for professionals from the audio field, musicians as well as consumers. Found back in 1995, by an American session musician, Skipper Wise, along with a Latvian recording engineer, Martins Saulespurens. For anyone interested in Blue’s acronym for Baltic Latvian Universal Electronics; some of the product that Blue Microphones designs and manufactures include condenser microphones, dynamic microphones, ribbon microphones, headphones, and USB microphones. There can’t be a best condenser mic list without the mention of the popular Blue Microphones Bluebird Cardioid Condenser Microphone. One of the first things that you’d notice is the cool 1950’s style design that makes the mic stand out. Some of the central appeals of the mic include cutting-edge design, Cardioid polar pattern, along with Class a discrete amplifier circuit. The mic offers superb sound along with maximum versatility. The mic basically controls everything perfectly including vocals, electric and acoustic guitars, strings, drums, and woodwinds. The All-Purpose Design tends to provide you excellent quality and the proprietary capsule, and discrete electronics component helps capture a specific sonic signature. The satin nickel plating and a baby-blue grip give Bluebird Mic an original vintage look. Together with all these features, the mic has the well-rounded audio performance to offer. It’s probably worth mentioning that the package includes shock mount and pop filter. The mics are super transparent, very clear, and worked well in every situation we placed it in. It offered excellent proximity effect and was massively versatile. The price is going to burn a hole in your pocket, so we can safely say that the condenser mic is pretty expensive compared to most other mics in our list of best condenser mics. Verdict: As you can see, the Blue Microphones Bluebird Condenser Microphone is pretty much what perfection looks like. But it’s not pocket-friendly. If you can’t afford it, check out some of the other relatively cheaper option in our list of best condenser mics. The Rode Microphones was founded in 1967 and is an Australian-based designer and manufacturer of microphones, all related accessories as well as audio software. Rode products are used for both studios as well as location sound recording like live sound reinforcement. Over the years, the company has come such a long way, which today the offer tons of products along with 60 different microphone accessories, which includes Rode Blimp which is very very famous. One of the unique customer services Rode seems to provide is that they offer extended warranty on most of its products. The Rode NTK Tube Condenser Microphone is one of the best condenser microphones we have comes across, and one of the fist things that we liked about the mic is its very large 1-inch capsule with gold plated diaphragm. The piece of equipment comes with a Class A valve circuitry along with a couple of other features like ultra low noise, wide dynamic range and hand-selected and graded 6922 twin-triode valves. The condenser mic comes with a dedicated power supply with high strength heat-treated steel mesh head, and not to mention the durable satin nickel finish. Besides the high level of RF rejection, the mic offers internal capsule shock mounting. The highs of this particular mic are crystal clear, the mids are warm, and the lows are very smooth. The condenser is one of the most expensive mics on our list and will surely burn a hole in your pocket. If you are aiming for low budget, then skip this one. Verdict: The mic comes with its own high-voltage power supply because phantom power just isn’t enough. So while the condenser microphone is great but expensive, regardless of which, it is something you could aim for if you can afford it. Regarded worldwide as a leading microphone manufacturer, Neumann products offer robust and attractive design, a unique sonic character, and carefully developed, innovative technology. Only recently the company launched a line of studio monitors that could help establish the brand for both output and input of the audio signal path. It isn’t too odd to see Neumann products in our list of best condenser mics because each and every Neumann product is subjected to rigorous quality control process ensuring that you get a product that surpasses incredible quality with reliability and lasting value. Neumann says that the TLM 102 defines a new generation of Neumann studio microphone. At a price, the microphone offers great performance and also offers value standard. One can easily notice that the mic is of a smaller size and the reduced overall size contributes to an exceptionally compact appearance which is great, to say the least. If you have ever used the Neumann microphone before, you can easily see, that the TLM 102 MT Condenser Microphone unites all of the typical design components of a Neumann microphone. The piece of equipment sports harmonious proportions and gleaming grille ring that makes it looks exceptionally attractive. It delivers impressive sound especially thanks to the newly developed technology of large-diaphragm capsule that basically clocks a maximum sound pressure level of 144 dB, and helps in permitting the recording of percussion, amps, and drums, at extremely high output levels, which is great, to say the least. The mic offers rich, vibrant sound quality and is an excellent choice for the price. The size is not too overwhelming that adds to the charm and the usage. The price tag is a back burner. Only people with the high budget should be able to afford it, so that’s a catch. Verdict: The TLM 102 is one the best condenser mics we have managed to lay our hands on, and of course, it is very pricey. But we have seen a number of high-end mics but this one truly terrific for the price. The AKG Acoustics are an Austrian manufacturer of headphones, microphones, another wireless audio system as well as audio accessories for both professional and consumer markets. Founded in Vienna, back in 1947, by two Viennese named physicist Dr. Rudolf Görike and engineer Ernst Pless and their products were first used by jazz clubs, radio stations, theaters, and cabarets. The company has ended up becoming a global brand and well-recognized name in the market. Over the years, the company has received several awards over the years, including the prestigious Technical Grammy award back in 2010. C414 XLII Vocal Condenser Microphone is known for their sonic characters that deliver astounding sound quality for lead vocals and solo instruments. The piece of equipment comes with nine selectable polar patterns that provide the perfect setting for every application that you will be using. There are three attenuation levels for close-up recording along with high-output sources of up to 158dB SPL, which is great, to say the least. And then the device also sports three switchable different bass cut filters that help reduce stage vibration or proximity effect or even wind noise. One of the highlights of this particular condenser mic is (and we also found this incredibly helpful) the overload warning that comes along with audio peak with LED to detect shortest audio peaks. Comes with a cool pop filter and adjustable mic and we really like the multi-pickup pattern. It’s expensive, way expensive for someone who is starting off but hey, it’s worth the money. Verdict: We’d recommend this condenser mic to all whether you are a rookie or a pro. The price is a big splash but it’s money well spent, so go right ahead, up your budget a bit and get your hands on this one insanely incredible piece of equipment. Shure Incorporated was founded back in 1925 in Chicago, Illinois and known for making professional and consumer audio electronics that comes along with discussion systems, mixers, digital signal processing, microphones, wireless microphone systems, and phonograph cartridges. Other product that the company is manufacturing includes high-end earphones, headphones, and personal monitor systems. The company started manufacturing microphones in 1932 that went on to become incredibly popular and more polished. Some of the other products that the company has introduced are Phonograph Cartridges, Sound reinforcement systems, Mixers and DSP, Conference, Wireless microphone systems, Personal Monitors, Earphones, and Headphones. It is one such company which is known for making the best condenser mics of the planet. Designed for studio use, this particular condenser microphone is rugged enough for live application and offers work in low self-noise, as well as extended frequency response specially tailored for vocal tracking and instrument recording. The piece of the device comes with a cardioid polar pattern which is just about the most commonly used pattern for both studio and live applications. As far as performance is concerned, you’ll find an extended frequency response, low self-noise, exceptional low-frequency reproduction, that comes along with ShureLockTM Rubber Isolated Shock Mount, Protective Velveteen Pouch, superior common mode rejection and suppression of radio frequency interference, not to mention there will be no crossover distortion, extremely uniform polar response, as well as high output level and high input SPL capability. We find the 3-position switchable low-frequency filter commendable that helps reduce unwanted background noise or counteract proximity effect. It’s a solid-built mic but offers boxy highs which can be a big drawback. Verdict: It’s a great sounding mic whose reproductions are pretty spot on. One of the highlights of the mic is that it’s accurate across the entire frequency spectrum, right from the smooth sweetness of the clarinet with equal accuracy to the biting edge of the saxophone, as well as the deep growl of the contra. The condenser mic is perfect. There is a good reason to know about how to take care of the condenser mic is that it’ll make the device durable and would be a worthy buy of our part, giving you a good value for the money that you’ve spent. Caring for your Condenser mics will make it last for years, and it’s nothing too difficult to do, it’s not a rocket science, so don’t worry. There are only a few things that you need to look into. The first thing that I can think of when you are done for the day with the condenser mic you just bought in, is that you’ll have to save it, be it in a closet or you keep it on the mic stand outside, you need to make sure that the place or room is not too humid. That is to say, keep the condenser mic stored in a controlled and cool place. To save the device from damage, we’d say it’s a good idea to have the pop filter up which will basically allow the moistures through the grills to seep out. This one is really necessary because of us are in the habit of spitting accidentally into the mic. By sound pressure, we mean the distance between the vocalist and the mic. Sound pressure is high when the mic is closer to the sound source. This could work in handheld dynamic microphones, but when it comes down to condenser mics, there are real possibilities that the high level of sound pressure could end up harm your mic permanently. So you must follow the maximum safe SPL rating of the mic for which you need to check out the SPL meter occasionally. One of the most significant steps that most people seem to miss or forget is the turning the phantom power button on or unplugging the mic cable, or switch to the off position before plugging in. Make sure that you are using the power while using the condenser mics which will be provided by your audio interface, mixer, or stand-alone preamplifier. This is a precaution that’ll save your device when there’s a surge of voltage that the mic can’t seem to handle. It might end up damaging the device’s battery, tube, or diaphragm which phantom power can save you from only if you’d switch it from.